OFFENSE and DEFENSE DVOA are adjusted based on strength of opponent as well as to consider all fumbles, kept or lost, as equal value. 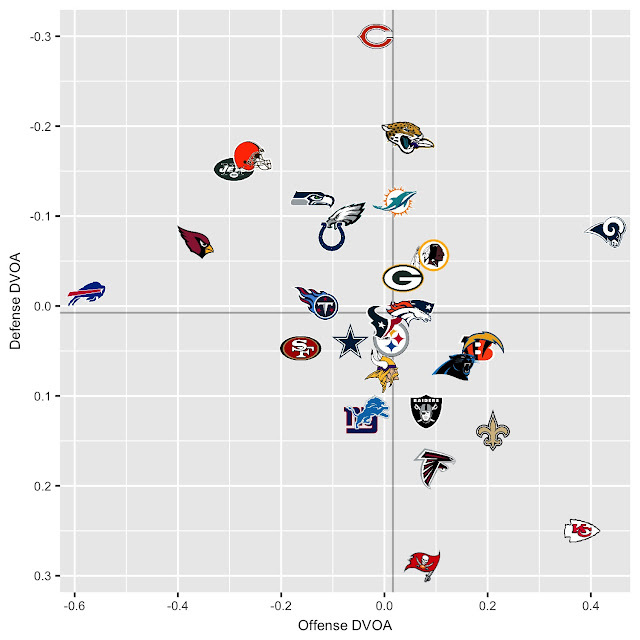 Looking deeper into Football Outsiders team efficiency ratings, I wanted to look at strength of schedules. The New Orleans Saints have played the easiest schedule (average DVOA of opponents) - Bucs, Browns, Falcons, Giants. The fun and games are over for the Saints as they have the fourth hardest schedule remaining. Quite the opposite for their division rivals, the Atlanta Falcons, who have the second easiest remaining schedule, after having the sixth most difficult schedule to start the season - Eagles, Panthers, Saints, Bengals. The Arizona Cardinals have played the toughest schedule over the first four weeks - Redskins, Rams, Bears, Seahawks. Somehow the Chicago Bears have had the second easiest schedule so far - Packers, Seahawks, Cardinals, Bucs - and the easiest schedule remaining! 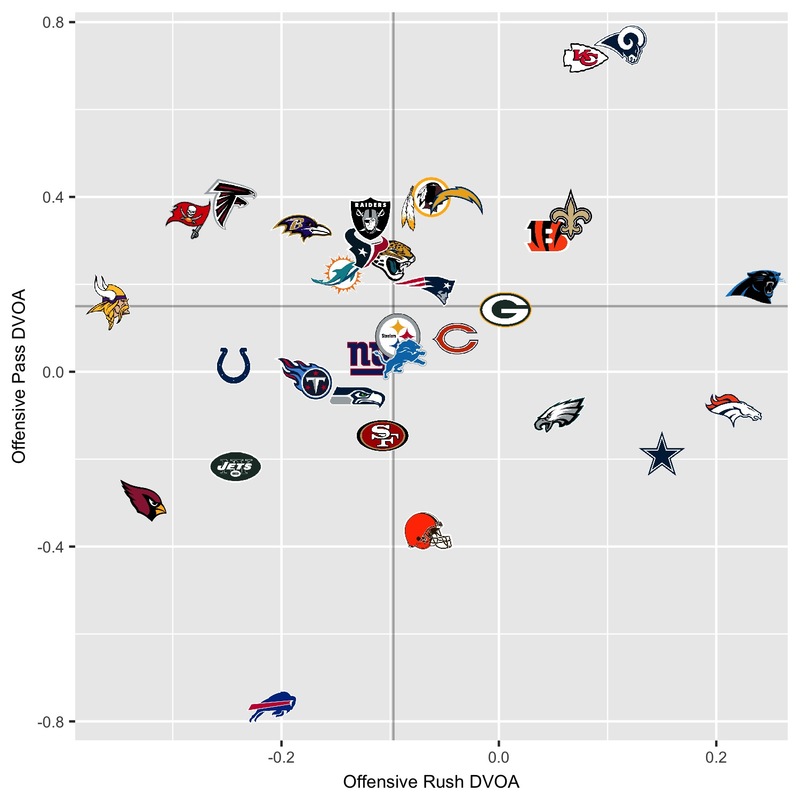 OFFENSE DVOA is adjusted to an average schedule of opponents and an average percentage of fumbles recovered by the offense. I am very interested in watching how far the Tampa Bay Buccaneers fall and if they end up in the bottom left quadrant by the end of the season. Jameis Winston has taken over for Ryan Fitzpatrick at QB, but will be without O.J. Howard for few games after their bye week. Marshawn Lynch has rushed for 300 yards already - will the Oakland Raiders stay focused on the ground game moving forward? 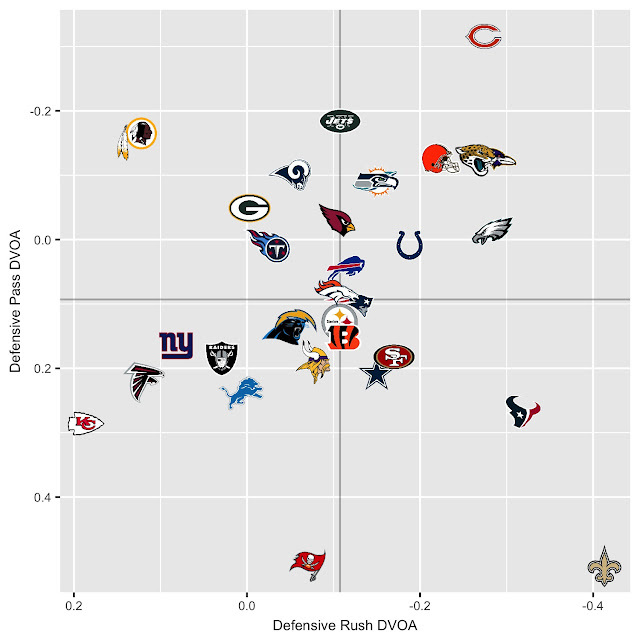 They are just 1-3 but have played the 3rd ranked average DVOA defenses - Rams, Broncos, Dolphins and Browns. All numbers are adjusted to an average schedule of opponents and an average percentage of fumbles recovered by the defense. The San Francisco 49ers defense have faced the toughest schedule this year - Vikings, Lions, Chiefs, Chargers. Thing should get better as they face Cardinals rookie QB Josh Rosen twice in the next four weeks. Only problem is, sandwiched in between are Aaron Rodgers and Jared Goff. It will be interesting to see if the Miami Dolphins defense can stay in that upper right quadrant for much longer. I don't think anybody saw them being this "good" prior to the season starting. Getting beat that bad by Tom Brady happens more often than not but he was their first real test and they failed.